Coco & April Real Estate Group is the team of choice on Chicago’s North Shore. 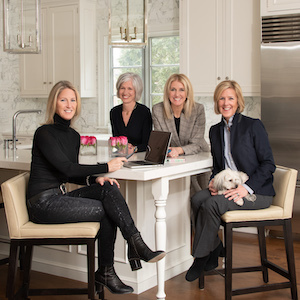 Coco Harris, April Callahan, Rene Nelson, Joanne Going and Emily Berlinghof have been established residents in the Wilmette, Kenilworth, Winnetka and Northfield communities for over two decades. With a combined 50+ years of experience, we have joined forces to create an exceptional team of professionals offering unparalleled personalized service supported by a national real estate technology company that is changing the face of real estate. COLLABORATION - Our clients benefit from our team spirit and collaboration. Each of us brings distinct strengths to the team and we work together to ensure that each selling client benefits from our combined expertise in pricing, staging, marketing, process expertise and negotiation. As buyer brokers, we cull appropriate properties that meet our clients’ needs and budgets and use our local market knowledge to ensure each client finds their perfect home. PASSION - We strive to exceed expectations for every client. Together we have a unique ability to understand our client’s needs and expectations, in-depth knowledge of the local real estate markets and trends, client service focus, strong relationships with other brokers, highly-tuned negotiating skills and tenacious work ethic. Whether you are buying or selling or just exploring the market, we will work with you throughout the entire process to help you maximize your investment and achieve your goals. SERVICE - Our clients’ real estate goals are the #1 priority. Whether working with first time or experienced buyers and sellers, we can easily adapt to each client’s needs and expectations. We are happy to share access to the best contractors, attorneys, inspectors and mortgage brokers, all of whom we have vetted to ensure they provide the same level of customer service, attention to detail, courtesy and discretion. Coco & April Real Estate Group serves Wilmette, Kenilworth, Winnetka, Northfield, Glencoe, Glenview, Evanston, Chicago and the surrounding North Shore communities, all within easy commuting distance to downtown Chicago, major highways and two major airports. The area's wealth of prestigious housing opportunities, excellent public and private schools, the proximity to Lake Michigan, the Metra train and parks & recreational facilities make it an ideal place to call home. Please call or email us when you’re ready to make your move! We sincerely look forward to working with you!